To be honest my university experience really peaked (no pun intended) with the Everest Base Camp trek at the end of my first year. It will be difficult to describe the friends I made, breath-taking views, and awesome physical challenge of the trip in one blog post, but I’ll do my best! The trip started in Kathmandu, an enchanting and bustling city, where we met our amazing guides Bhabanath and Santosh. The following day we packed into a small plane to Lukla, the starting point for the actual hike to Base Camp, amidst stunning views of snow-capped Himalayan mountains and valleys. Upon landing (on quite possibly the world’s shortest runway), we began our travels along the yak-filled trails towards Phakding, our first overnight teahouse during the trek. What followed was 11 days of awesome views and questionable banter, during which we made our way towards Base Camp through stays at a series of tea houses. After our stay at Phakding, trekking by waterfalls and over bridges above white water rapids, we reached a height of 3,400 metres, at the trading town of Namche Bazaar. This was stunning, with a man-made waterfall flowing through colourful gates cutting through the town, a busy local market full of wonderful Tibetan souvenirs, and the highest sports bar in the world (probably). We had the pleasure of staying here for 2 days, using it as a base for an acclimatisation trek, and got to visit a Buddhist monastery, which was a big highlight. Following this, we made our way up to Thyangboche, through tea shops and with more stunning views over the Dudh Kosi river, this time getting our first glimpse of Everest in the distance. Here we got to watch the Buddhism monks chant in a newly rebuilt monastery before a giant statue of the Buddha, which was a truly incredible experience. After this surreal opportunity, we trekked to Dingboche (at 4,410 metres), during which I accomplished my lifelong goal of a selfie with a yak, and stargazed at the remarkably clear night sky. 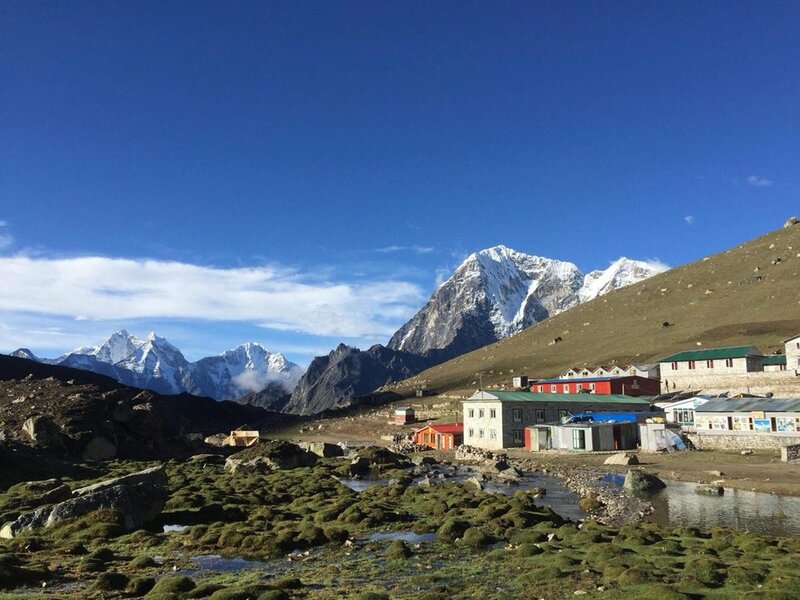 The next couple of days involved stays at a tea house at Lobuche (with allegedly the world’s highest bakery), followed by Gorak Shep (the 1953 expedition’s base camp location). From Gorak Shep, at 5,200 metres and dizzy from some cheeky altitude sickness, we trekked towards the apex of our adventure: Everest Base Camp. It was a tough trek, but absolutely worth it to stand at the foot of the world’s tallest mountain, surrounded by snow-capped peaks and new friends. Nonetheless, the trip wasn’t over, as we awoke at Gorap Shep at 3am the following morning to climb Kala Pattar, a small peak meaning ‘black rock’. This was by far the most physically demanding part of the trek, with a consistent boulder-laden incline, but again well worth it to watch the sun rise over Everest and the Khumbu glacier. Making our way back towards Kathmandu, I realised how lucky I was to have experienced this all. The Himalayas are stunning, and I cannot recommend the trip enough. It was absolutely the trek of a lifetime!